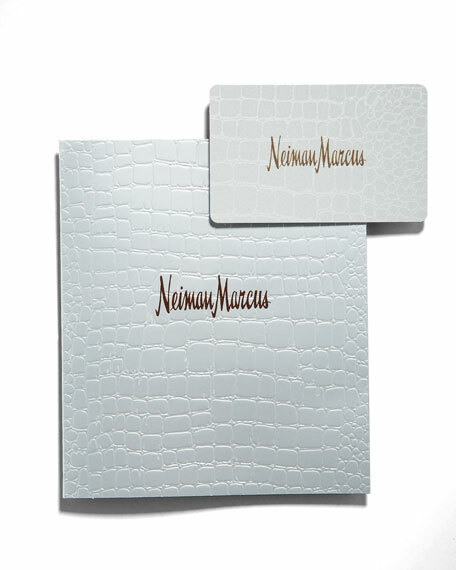 Give the gift of luxury with the Neiman Marcus gift card*. Each purchase is automatically deducted when the card is used in stores or online, until the total amount has been spent. Card features silver crocodile design and arrives in an NM signature decorative sleeve. Available in monetary increments below. For Corporate Gift Card inquiries, click here. Because processing of gift cards requires up to three days, next-day delivery is not available. Please select "Standard" as your shipping option. Gift cards will be shipped via FedEx® and will require a signature upon delivery. Please note: Federal law now requires Neiman Marcus and other retailers to obtain, verify, and record information that identifies customers in connection with purchases of gift cards that equal or exceed $1,000 in value. NM Gift Cards may be treated the same as cash. NM Gift Cards are not redeemable for cash, nor can they be returned for a cash refund. NM Gift Card actual cash value is 1/10 of one cent. NM Gift Cards cannot be purchased with an NM Virtual Gift Card, nor can they be used to purchase an NM Virtual Gift Card. NM Gift Cards cannot be applied as payment on Neiman Marcus Credit Card accounts. The NM Gift Card is immediately redeemable once your recipient receives the NM Gift Card via standard shipping (we'll send up to three days after processing your order). Sales tax is applicable on any merchandise purchased with an NM Gift Card. Delivery to an incorrect but deliverable shipping address is the sole responsibility of the purchaser. Delivery to a non-existent shipping address is the sole responsibility of the purchaser. Neiman Marcus is not responsible for lost or stolen NM Gift Cards. For in-store inquiries, use sku #1881887.